When I know I won’t have much time in the evening to prepare dinner, the crock pot makes us all feel like no one skipped the effort of making a real dinner. Tonight was open house at my daughter’s school, so we had to be home, fed and back at school by 6:30 pm. 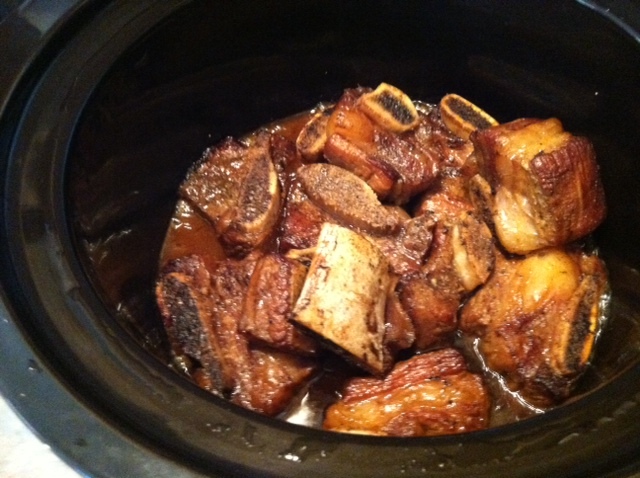 Yesterday, I pulled a packet of beef short ribs (about 3.5 lbs) from the freezer and let it thaw in the afternoon. I stored it in the refrigerator overnight, and while I got the kids ready for school this morning, I loaded the crock pot. 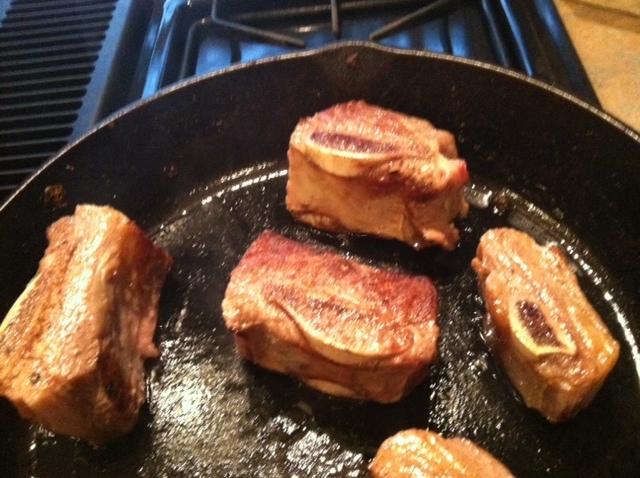 First, I browned the short ribs on all sides in a cast iron pan. For the past two years, we get our beef from a local man who raises beef cows. We pay him for the meat and a butcher to process it, so it isn’t necessarily less expensive, but the meat has been wonderful! And, we know where our cow has been. While the ribs were browning, I put chopped onions (1.5 c.), 2 T. of beef base, and 1/4 c. of water in the crock pot. I tried to dissolve the beef base into the water, but didn’t try too hard. Then I stacked the browned ribs on top of the onion mixture, put the pot on low and went to work. At lunch, I pulled into the garage and it smelled heavenly. On top of that I added potatoes (4 medium), about 2 c. of my volunteer Juliet tomatoes (whole), 1.5 c. chopped kale, 2 T. tomato paste, and sprinkled it all with rosemary, sea salt and fresh ground pepper. After covering that up, back to work I went. 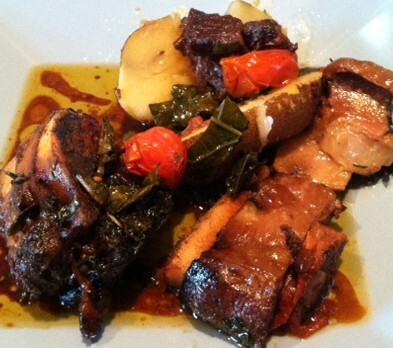 The meat was so tender, it was easy to peel away and discard the fat from the rib meat before serving. Also, the tomatoes added a zing to the flavor that helped cut the frequently greasy flavor of beef ribs. YUMMM. AND, I have some left for lunch tomorrow! 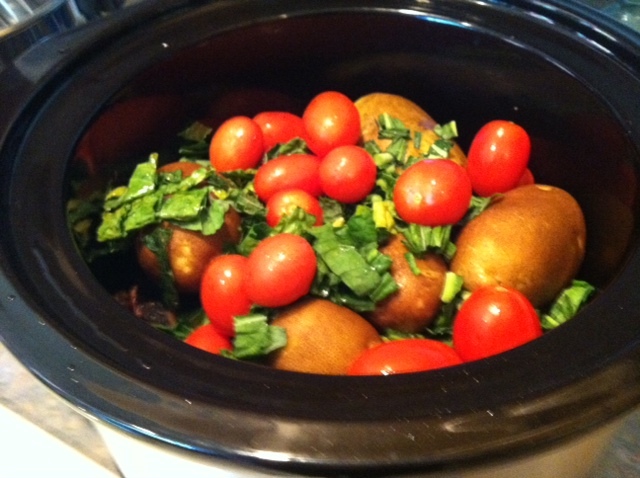 This entry was posted in Recipes and tagged beef short ribs, crock pot, onions, potatoes, potatos, rosemary, slow cooker, Tomatoes. Bookmark the permalink.